New technology is on the road in Mesquite working to help police find criminals passing through town. Austin Carter reports. New technology is on the road in Mesquite working to help police find criminals passing through town. They're called Automated License Plate Readers, which looks for stolen cars and wanted suspects. The technology works through four cameras on the roof of two Mesquite Police Department vehicles. The cameras can cover all angles and automatically scans nearby license plates, then alerts the officer to anything alarming that pops up. “I could imagine there is a lot of crime in Las Vegas, so a stolen car would be pretty easy to head up to St. George for a while and lay low and get a clean record,” said one driver. Mesquite PD says Automated License Plate Readers will be a major tool along Interstate 15 as folks make their way in and out of Nevada. But some are concerned that this technology may compromise the security and safety of drivers' identities. “To collect random amounts of data as people are driving down the street, we can find to be a violation of people’s privacy,” says Todd Story, ACLU of Nevada. 13 Action News took those concerns to a Mesquite Police Department spokesperson, who tells us the technology is extremely safe. They say there’s no bias involved and that the cameras look at plates, not drivers. Also, they say the information is confidential. 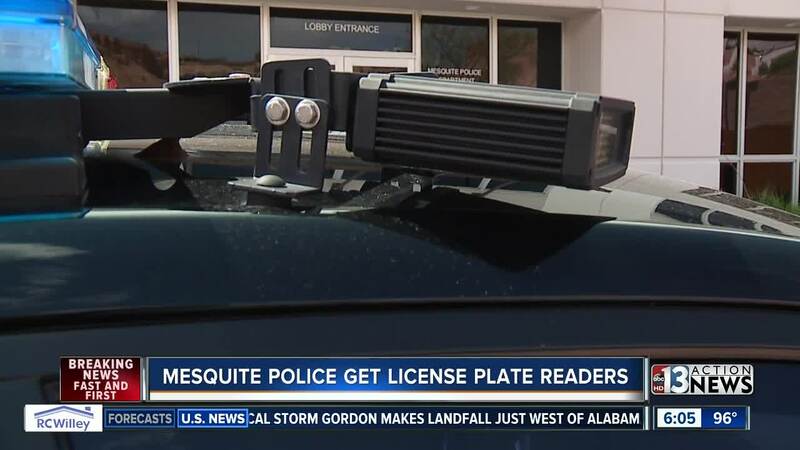 Mesquite PD is also installing free-standing versions of the technology across the city.